BOSTON BlackRock's (BLK) iShares unit is reducing the investment fees charged at six of its largest exchange-traded funds as the biggest ETF provider expands a fee-cutting war that's benefiting cost-conscious investors. The recent expense cuts by iShares, Vanguard, Charles Schwab and other ETF sponsors present a further challenge for traditional mutual funds, which are attracting new cash from investors at a far slower rate than ETFs. BlackRock on Monday also announced that it is launching four new iShares ETFs and revamping some of its existing lineup with a goal of making ETFs more appealing to long-term, buy-and-hold investors. Beginning Wednesday, BlackRock's two lowest-cost stock ETFs will charge expense ratios of 0.07 percent, or 70 cents a year for every $1,000 invested. The largest of those two ETFs, the nearly $32 billion iShares Core S&P 500, had previously charged 0.09 percent, while iShares Core S&P Total U.S. Stock Market charged 0.20 percent. Those are the ongoing charges to cover fund operations, expressed as a percentage of assets. New fee levels at the other four iShares ETFs that are cutting expenses range from 0.08 percent for an ETF investing in a diversified portfolio of bonds to 0.18 percent for an ETF investing in stocks listed in emerging markets countries. The cuts follow a move last month by Charles Schwab Corp., a much smaller player in ETFs, to reduce expense ratios at its lowest-cost stock ETFs to 0.04 percent, lowest in the industry. Vanguard Group and best known for its index mutual funds, has cut expenses at 40 of its 64 ETFs over the past 12 months. In many instances below fees charged to invest in comparable ETFs from iShares as well as State Street's "SPDRs" ETFs family. IShares was the market leader with a nearly 44 percent share of U.S. ETF assets managed as of August, according to the research firm ETFGI. Combined, iShares, State Street and Vanguard commanded 84 percent of the market, with Vanguard posting the fastest growth rate recently. Index mutual funds have long been the first choice for anyone looking to invest on the cheap, but they're now being undercut by the lowest-cost ETFs. Both seek to match rather than beat the market by investing in a basket of stocks or bonds. Fees are typically low because investors aren't paying managers to pick investments. A distinct feature is that ETFs can be traded throughout the day like stocks, unlike mutual funds that are priced only at the close of daily trading. Also, with ETFs, average investors pay the same expenses as institutional investors, unlike with mutual funds. ETFs emerged two decades ago as trading tools for professional investors. But their low costs and index investing approach are drawing more average investors. The consulting firm Strategic Insight estimates that individuals own about 60 percent of assets in ETFs, and account for a similar proportion of money flowing in and out in a given period. The remaining 40 percent is attributed to institutional investors, such as pension funds. ETFs are on track to record their sixth-consecutive year of attracting more than $100 billion in new cash, according to Strategic Insight. Through the first nine months of the year, net deposits into ETFs totaled $129 billion. However, assets in mutual funds are still about 10 times larger than the total in ETFs, with about $1.3 trillion in ETFs versus $12.5 trillion in mutual funds. In addition to cutting expenses, New York-based BlackRock is launching four new iShares ETFs, three of them investing in foreign stocks and one in the U.S. short-term bond market. The launches as well as other moves announced Monday are intended to round out its ETF offerings by creating a group of 10 "Core Series" ETFs from its existing lineup and the four new ETFs. The series is aimed at helping investors build a broadly diversified investment portfolio to accumulate retirement savings. Many existing iShares ETFs invest in smaller market niches, such as a particular industry or other segment of the stock market. BlackRock also announced plans for a global iShares brand campaign that will include advertising in the U.S., Canada and some European markets. The moves "are key components of our broader plan to drive even stronger growth in the U.S. and globally," said Mark Wiedman, global head of the iShares unit. BlackRock said the expense cuts announced Monday are expected to reduce annual revenue at its iShares unit by $35 million to $40 million, an estimate that assumes no change in assets flowing in or out of the ETFs in response to the expense reductions. The ETF moves were announced shortly before the close of trading on Wall Street. 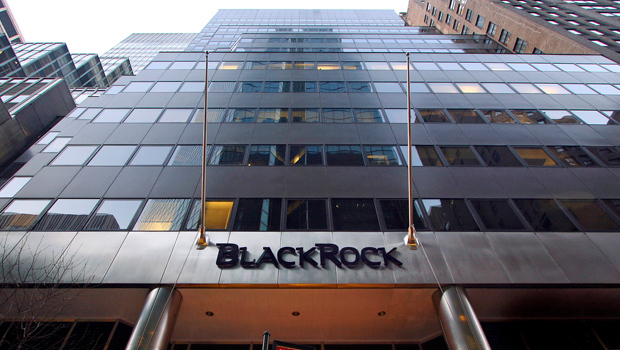 BlackRock's stock rose $1.06, or about 0.6 percent, to end at $185.37.